Entering 1991, New Japan was going through a transition phase as the stars of the 1980s gave way to the new generation that would lead New Japan. Antonio Inoki, Riki Choshu, and Tatsumi Fujinami were taking lesser roles as the early 90s progressed and the new stars Keiji Mutoh, Masahiro Chono, and Shinya Hashimoto were taking the stage. Later coined as the Three Musketeers, these three wrestlers would lead New Japan into one of their most prosperous periods, but in 1991 they were still young stars with unlimited potential. New Japan had also invested in three giant gaijins: Crusher Bam Bam Bigelow, Scott Norton, and Vader. These three power houses were perfect foils for the native wrestlers and they would have many heated encounters. Keiji Mutoh had returned to New Japan in 1990 after a very successful run in World Championship Wrestling, as in perhaps the most successful excursion in recent memory he was immediately elevated to the top of the card. That didn't lead to instant success however, as even though he picked up wins over such stars as Tiger Jeet Singh, Ricky Steamboat, and Shiro Koshinaka he was unable to get any title shots as there were still too many wrestlers above him in the pecking order. He did manage to win the IWGP Heavyweight Tag Team Championship with Masahiro Chono, however, a title that they would hold for over six months. In 1991 he began the year defeating Sting, but at the Sumo Hall event in April he would lose to the massive Scott Norton. After a hot start in the late 80s, Vader was still a force to be reckoned with as he was one of the most feared gaijins that had ever set foot in New Japan. With wins over Antonio Inoki, Shinya Hashimoto, Riki Choshu, Tatsumi Fujinami and many others, few had gotten the better of Vader. In January of 1991 he won the IWGP Heavyweight Championship for the third time, defeating Tatsumi Fujinami. Fujinami would win the title back a few months later, but in June Vader manhandled the rising star Scott Norton to show that he was still the dominate gaijin in New Japan. In the summer, it was announced that New Japan would hold a tournament called the G1 Climax. The tournament would have two blocks with four wrestlers in each block, and the tournament would be round-robin. Each wrestler would wrestle all three wrestlers in their block, and the wrestler with the most points would reach the finals to fight the winner of the other block to crown a winner. The wrestlers in Block A were Keiji Mutoh, Tatsumi Fujinami, Scott Norton, and Vader. Block B would include Crusher Bam Bam Bigelow, Riki Choshu, Masahiro Chono, and Shinya Hashimoto. The tournament would stretch over four days, with the first three days holding the tournament matches and the fourth day having the final. The last three events were held at Sumo Hall, a large venue that showed New Japan's confidence not only in the tournament structure but also the wrestlers in the tournament. Going into the tournament, Keiji Mutoh had drawn a very difficult Block. First was Tatsumi Fujinami, who was the reigning IWGP Heavyweight Champion. Then came Vader, a three time champion who Mutoh had never faced in a singles match. And finally there was Scott Norton, who had just defeated Mutoh a few months prior in a singles match at Sumo Hall. The cards were definitely stacked against him as he had none of his fellow Musketeers in his block but rather two gaijin monsters and the reigning champion of New Japan. But Mutoh was the crowd favorite, as his matches both as himself and Muta had electrified the crowd since his return in 1990, and everyone knew that he would put on a show. On August 8th, the G1 Climax began. Mutoh's first match was against Scott Norton, who had gotten the better of him once before. 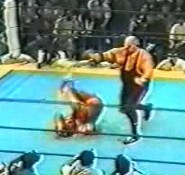 Norton proved that the first time wasn't a fluke, as he defeated Mutoh with a Powerslam. Vader also had trouble on day one, as Fujinami would defeat him for the second time in 1991 with a backslide. Mutoh's opponent on August 9th was Fujinami, and Mutoh shocked the champion with an Inside Cradle to pick up two key points. In the main event Vader wrestled Scott Norton in a huge match between the two gaijins. Scott Norton put up a fight, but Vader would win via Count Out and would also be awarded two points. Going into the third and final day, all three wrestlers had two points. 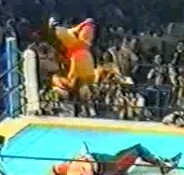 Norton and Fujinami wrestled first, but the match would go to a Double Countout so each wrestler only got one point. This meant that if there was a victor in the Keiji Mutoh vs. Vader match, that wrestler would go on to the finals of the first G1 Climax. The stage is set. As his music begins, loud "Mutoh!" chants come down from the crowd and a large cheer erupts as he makes his way towards the ring. Vader comes out next, and instead of taking off his mask he keeps it on as smoke shoots out of it and the crowd cheers. Vader carries the mask to the other side of the crowd as it continues shooting smoke until finally entering the ring. Vader certainly has his fans as well, as they knew that they were about to see the match they had been waiting for all night. Streamers for Mutoh but none for Vader, as the "Mutoh" chants begin again. The bell rings, and we are under way. Tie-up to start the match but they break cleanly. Another tie-up but Vader hits a headbutt, knocking Mutoh away and breaking the hold. Vader pushes Mutoh into the corner and sends blows down on him before hitting a stiff forearm shot to the face. The wounded Mutoh rolls out of the ring to get away from the onslaught, but returns on his own after a moment. They circle each other, tie-up, and Mutoh hits a combination of slaps, sending Vader back peddling until he falls out of the ring. Now it is Vader recouping at ringside, but he gets back into the ring and they face off again. Hard slap by Vader, and Mutoh drops to the mat. Vader picks him up, Irish whip, and he levels Mutoh with a lariat. Vader picks him up again and hits a falling powerslam, cover, but Mutoh kicks out at two. Back up and Vader delivers the Vader Hammer punches. Irish whip by Vader but Mutoh rolls under the lariat and delivers a dropkick. The monster stays standing, Mutoh goes off the ropes again and hits a shoulder block but it also has no effect. Quick back kick by Mutoh and another dropkick finally gets the big man off his feet. Vader rolls to the floor but returns quickly, wristlock by Vader and he hits another hard lariat. Vader applies a stretch hold to Mutoh and clubs Mutoh repeatedly in the face. Cover, but it gets a two count. Vader drags Mutoh to his feet, Irish whip, and he nails the Vader Attack. This sends Mutoh out of the ring, but Vader goes out after him and throws him into the railing. Vader then hits Mutoh into the crowd before throwing him into the ring post. He finally slides Mutoh back into the ring and taunts the crowd before returning as well, but Mutoh dropkicks him as he gets onto the apron. Mutoh then approaches the ropes and sails out onto Vader with a pescado. 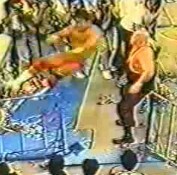 Mutoh gets up first and throws Vader into the railing before hitting the cartwheel back elbow smash! Mutoh gets back in the ring at the referee's request and Vader slowly follows, snapmare by Mutoh and he delivers the Flashing Elbow. Cover, but Vader kicks out at one. Mutoh applies a side headlock but Vader gets back to his feet and punches Mutoh repeatedly in the face. Vader picks up Mutoh, Irish whip, and he takes off Mutoh's head with a lariat. Cover, but Mutoh manages to get a shoulder up just in time. Vader applies the Dragon Sleeper, but Mutoh quickly slips out of it. Vader goes for a vertical suplex, but Mutoh lands on his feet and hits a running forearm smash! Vader is on all fours but returns to his feet only to eat a dropkick. Vader delivers a punch but Mutoh drops Vader with a backdrop suplex. Mutoh goes up to the top turnbuckle and hits a missile dropkick, cover, but it only gets a two count. Mutoh goes up top again and nails the moonsault, cover, but Vader kicks out! 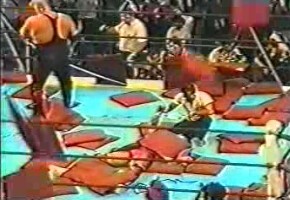 Pillows immediately start raining down from the crowd as Mutoh stays on the mat, beaten and exhausted. Vader stomps around the ring amongst the pillows as finally Mutoh gets up and pumps his arm into the air. Vader offers him his hand and shakes it before raising his arm into the air. Vader then storms off and leaves the ring as Mutoh celebrates in all four corners with his music playing and the crowd on their feet. Mutoh had passed the test and defeated the great Vader to reach the finals of the first G1 Climax. In terms of big singles matches, the G1 Climax proved to be critical in the development of Mutoh's career. First he defeated the reigning IWGP Heavyweight Champion, and then he defeated the most dominate gaijin perhaps ever to win a tournament block that most had assumed he had no chance of winning. 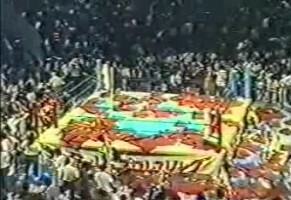 The crowd understood the importance of these events, which is clear by the way the pillows came flying into the ring. At Sumo Hall, the fans used to sit on pillows, and if the match was great or a big upset occurred that the fans were happy about they would throw the pillows in the ring. This happened very rarely, but here there was no hesitation by the crowd as the pillows were hitting the ring seconds after the bell had rung. Of course, we all know what happened from there. In the finals, Keiji Mutoh would face his friend Masahiro Chono, who just earlier that year he had held a title with. In one of the greatest matches of the year, Chono would come up victorious. Chono would go on to have title shots before Mutoh, but Mutoh would win the IWGP Heavyweight Championship first as he defeated Riki Choshu in 1992. The G1 Climax was so successful that it would become an annual tournament for New Japan which continues to this day, making it the longest consecutively running wrestling tournament in the world. Mutoh and Chono's popularity would continue to rise and they along with Hashimoto would lead New Japan for the next ten years. This match-up against Vader wasn't the only match that helped his elevation, but it was certainly key as it led to his career-elevating match against Masahiro Chono and also showed that Mutoh had the ability to defeat anyone that New Japan had to offer.